SILVER SPRING, MD (August 24,2010 – September 2, 2010) – Riderwood residents are crocheting coral reef items in quick-turnaround for inclusion in The Smithsonian’s National Museum of Natural History’s exhibition, the “Hyperbolic Crochet Coral Reef,” a thought-provoking fusion of science, conservation, mathematics and art. 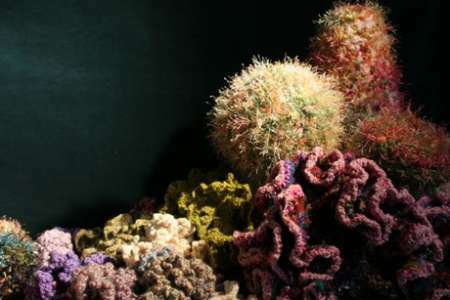 Their crocheted coral reef items will be given to the Smithsonian on Thursday, September 2. By engaging Riderwood residents and other concerned environmentalists worldwide to crochet coral reef items, the exhibition celebrates the beautiful diversity of coral reefs and speaks to the urgent need to protect these vanishing ecosystems. Created and curated by Margaret and Christine Wertheim at the Institute For Figuring, this Smithsonian exhibition will be on display in Washington, D.C, from October 16-April 24, 2011. Martha Vayhinger, a social worker who moved with her husband to Riderwood from their former home in Silver Spring, is directing the intricate crochet project in which fellow residents Mitze Brown, Helen Helm, Lillian Hearl, and Margaret Hays are participating. 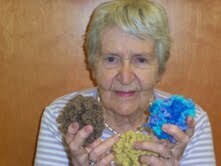 As many as 20 crocheted coral reef items are being made by the residents in a one-week timeframe. The patterns of coral reefs are geometrically complex, according Vayhinger, who still works each day as a social worker. “We are telling the story of coral reefs—their beauty and the threats they face—through crochet,” she said. As the name suggests, the “Hyperbolic Crochet Coral Reef” also incorporates the world of mathematics. Throughout the ocean, the diverse forms of kelps, corals and sea slugs are variations of a geometric form known as hyperbolic space. Mathematicians had long believed this type of geometry was impossible to represent physically, even though it has existed within nature for hundreds of millions of years. Coral reefs pulsate with colors and movement. They support more species per square meter than any other ocean ecosystem. Because of this phenomenal diversity, coral reefs have been called the rainforests of the sea. The corals themselves form the basic reef structure. Tiny coral polyps leave behind limestone skeletons, which build up over the centuries…layer by layer. Abundant sunlight and warm water supply food for the sponges, algae, fishes, and thousands of other species who gradually move in. Coral reefs that took millions of years to build have been disappearing within just decades as a result of human activities. “It is up to us to help preserve those that remain,” said Vayhinger.